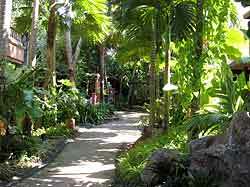 Like another of our favorite restaurants, Ruen Mai, in Krabi, many of the seats are nestled in amongst greenery. 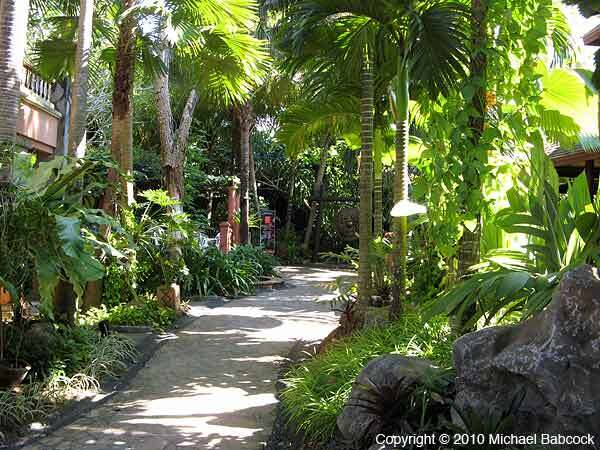 At Sudaporn there’s also a pond and a fountain giving that lovely water sound as you eat. They do a number of dishes really well. 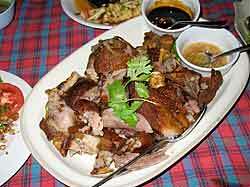 My absolute favorite is the Fried Pork Leg. The pork leg is stewed ahead of time until it is succulent and tender; then it’s deep-fried so that the skin is caramelized and crispy. My oh my, it melts in your mouth. It’s worth a visit here just for this one dish! 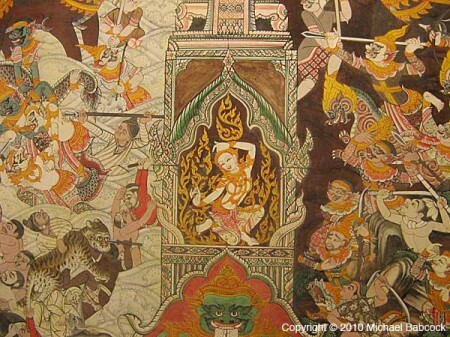 One caveat: you must order from the Thai menu. The English version is considerably smaller and lacks many of these favorite dishes. 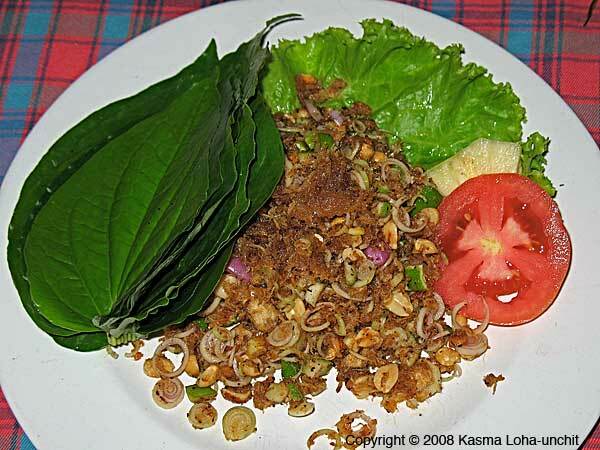 Another dish that Kasma invariable orders is Miang Takrai, or “Lemongrass Miang.” Many people are familiar with the more common Miang Kam (or Miang Kham), which Kasma calls (in her recipe) Tasty Leaf-wrapped Tidbits. 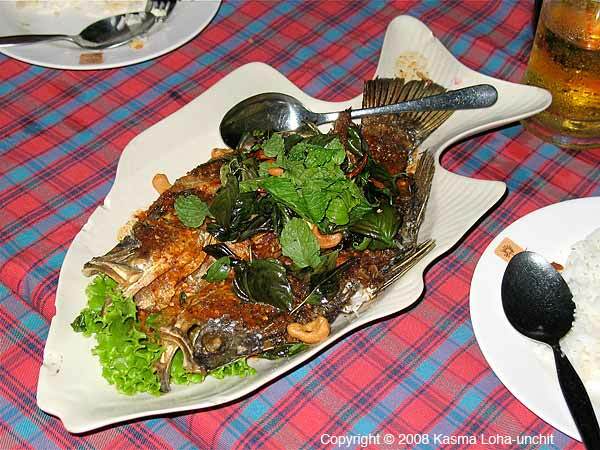 The idea behind a miang is that the ingredients of the dish are wrapped up in the wild pepper leaf called bai cha plu, which is almost universally misidentified as betal leaf. (See Kasma’s blog Miang Kam uses Bai Cha Plu NOT Betal Leaf (Bai Plu)). 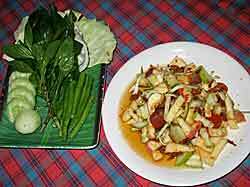 This dish is a lemongrass salad that is wrapped up in the leaf for eating. There are two other dishes I’ll mention. One is a fruit salad; in Thai – Som Tam Ponlamai. 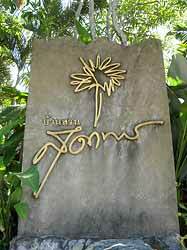 You may recognize the first two Thai words – Som Tam, which is the name for one of the most popular of all Thai dishes – Green Papaya Salad. Som means sour and tam means to hit; the name comes from the way the salads are made, which is by being (lightly) pounded in a mortar and pestle. Thap Thiang, Mueang Trang Trang 92000 Thailand. Use the Google Map to Sudaporn to help you get there. You are currently browsing the Thai Food and Travel Blog blog archives for November, 2011.